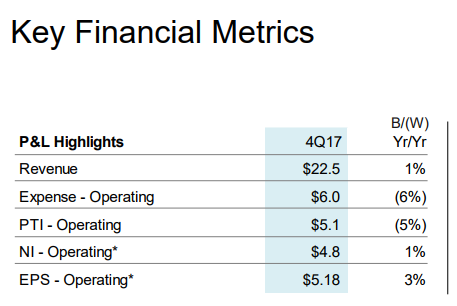 Here’s a surprise: After 22 quarters of consecutive year-over-year revenue declines, IBM today reported that its revenue increased from Q4 2016 to Q4 2017. The company reported revenue of $22.5 billion for the last quarter, up from $21.77 billion a year ago. Earnings per share came in at $5.18. Analysts expected revenue of about $22.06 billion and earnings per share of $5.17. Whether this is a sign of a long-term return to growth at IBM remains to be seen, but it’s surely a hopeful sign for the company. Virtually all IBM business units reported increased revenues, including 32 percent growth in the “Systems” unit, which includes hardware and operating systems software — and which interestingly was an area where IBM definitely struggled in the past, though its z Systems and storage line is showing some clear growth now. IBM’s hybrid cloud services, as well as security and mobile service, which fall under the “Technology Services & Cloud Platforms” segment, saw 15 percent growth in the last quarter, even as the overall segment saw a 1 percent drop in revenue, to $9.2 billion. The company also notes that it took a $5.5 billion charge because of the enactment of the U.S.’s Tax Cuts and Jobs Act. IBM’s GAAP tax rate, including this one-time charge, was 124 percent for Q4 and 49 percent for the full year. That’s not unexpected, but it may hurt the company as it’s looking to grow its revenue over the next few quarters.